Black and white negative showing the Eastern Canadian champion lacrosse team from the Brooklin Lacrosse Club. 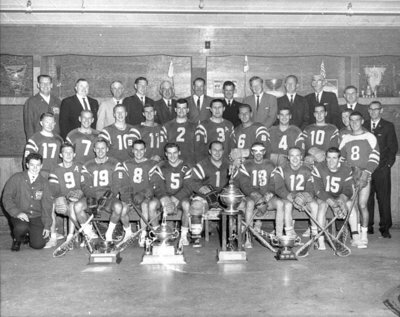 The team is posing with the Eastern Canadian trophy, the Harry Lumley trophy (won by Pat Baker), the Lionel Conacher trophy (Ontario Championship), and the Gene Dopp trophy (MVP won by Glen Lotton). Back row: H. Benson, Cliff Gordon, Art Bradley, Bob Vesey, William Vipond, Luther Vipond, Charlie Richardson, Red McClelland, Walt Hains, Jerry Gray, Art Morton. Centre row: Mike Gray, Doug Vipond, Ken Crawford, Grant Hefferman, Ken Rattan, Bob Hanna, T. Cullen, Donny Bruce, Jerry Burroughs, Don Vipond, R. Madgett, R. Allen. Front row: Peter Vipond, Elmer Tran, P. Henderson, C. Ludlow, Glen Lotton, Pat Baker, L. Campbell, Ken Lotton, Don Craggs. Brooklin Senior Lacrosse Club, 1964, unknown photographer, Whitby Archives, 21-016-008.